Let me start with the good news of the season! We have signed an agreement of sale for purchase of our school land! We hope to start the construction of school building from next month God willing. ...And of course, we need loads of help to build the school building. Any contribution, in any form is welcome. We would be most grateful as this will be a big step towards providing our best to village children coming from economically poor families! This October is an unforgettable experience for me. We have been able to successfully rehabilitate Panayur, a small hamlet on outskirts of Chennai, completely devastated during Tsunami floods last year. A grand ceremony was organized on 11th Oct, 2005 to officially handover the village amenities to village Panchayat, as part our Tsunami Rehabilitation initiative. Hon’ble Minister Thiru D Jayakumar, Minister for Law and Information Technology, commended the indomitable spirit of villagers who left no stone unturned in bringing life back to normal. 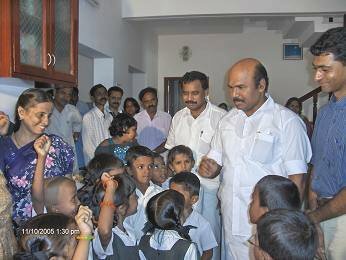 Later in the day, he met children from Gurukulam and was quite amazed by the 'Baba black sheeps...', 'Jack and Jills...' and all rhymes coming from the nascent minds. He was in all praise of the children and the teachers who brought the best out of them. 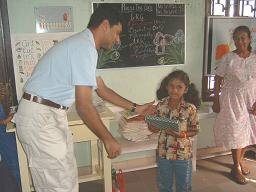 This November saw us celebrating the Children's day. 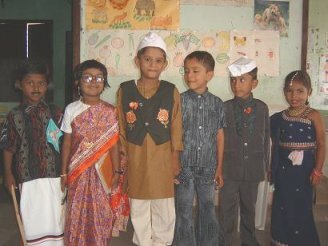 Teachers and parents together got our children dressed up for FANCY DRESS competition . 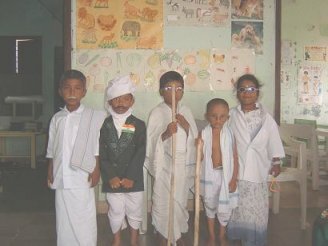 This was the first fancy dress competition held at the school and enthusiasm was simply amazing! Such was the response, it was actually difficult to identify who is the actual child behind the scene! Great fanfare ... great ideas ... The children had dressed up as Nehru, Gandhi, Avaiyar (A Tamil Poet), Bharathiar (Our freedom fighter and Poet), Policemen, Gypsies, Doctors, Teachers...the list was varied and cute. We are now looking at starting the construction of new school building and are looking forward to your continued support. UWCSEA Singapore and Yogoda Satsanga Society of India, who have always stood by us, are extending their support by helping us with the school building, as part of their Tsunami rehabilitation efforts. We hope more corporate/ individuals will extend their support towards building a permanent structure, and sponsoring a school bus for the school and help make a positive difference to these children.